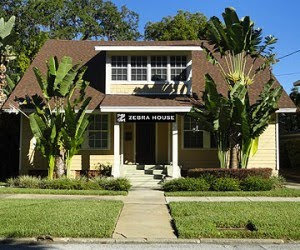 "Recently, Zebra Coalition acquired an official home in downtown Orlando, known as Zebra House. Our new home will be used for many purposes. Coalition staff will use the house as an office space to operate our hotline and address the needs of youth that come to us for assistance. Zebra House will temporarily accommodate homeless LGBTQ youth overnight while their needs are being assessed. The house will also be used as a meeting space for a few of our partners, including Orlando Youth Alliance and the Center for Drug-Free Living. Zebra House will be fully operational in a few short months, but it was missing one last piece of the puzzle—furniture! Zebra Coalition held a special fundraiser this week, specifically designed to generate donations to furnish the organization’s new home. The event was a huge success and raised enough to supply beds, office furniture, and most of the other items needed to make Zebra House both operational and an inviting space for youth in need of comfort and assistance. We look forward to the year ahead in Zebra House, and are excited about our future possibilities. We also would like to extend thanks to our many supporters. Your devotion is very much appreciated, and will make a wonderful difference in the lives of those who we strive to help"
See the Zebra Foundation's original blog post here.